24/4/08 — Acquisition — Paris, Musée du Louvre — We had published (in French, on La Tribune de l’Art) an article by Daniel Alcouffe concerning the disastrous sale in 1887 of the crown jewels. He expressed his regret that the Louvre had until now been unable to acquire the Waist bow with two tassels, a gift of Napoléon III to the Empress Eugénie at the time of the Exposition Universelle of 1855, after a failed attempt at Sotheby’s in 2002. 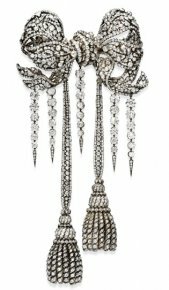 Fortunately, the object, created by the jeweller Kramer and adapted in 1864 into a brooch, has just been purchased by the Louvre through Christie’s New York (ill.). Once again, the event illustrates to what extent the sale in 1887 was a mistake and pleads the cause of “inalienability” since the repurchase price for the jewel was extremely high : 6.72 million €. The funds were raised in great part thanks to the sum of 5 million € made available by the Amis du Louvre from the estate bequeathed by M. and Mme Michel Rouffet. This new acquisition will be displayed in the Apollo Gallery in the museum.